Anheuser-Busch are one of the world's largest breweries, carrying brands such as Bud Light and Beck's. In the US their products are distributed via a complex array of reseller channels, making it difficult for Anheuser-Busch to get a clear insight to how often and in what quantity their beers are sold. Mob provides an incredibly flexible and robust mobile voucher platform. They were given the challenge to help re-sellers of Anheuser-Busch move more products through their bars. Having worked with VMob before, UiRevolution was contracted to help deliver two things, an app for the bar owners and app integration with their TVs. 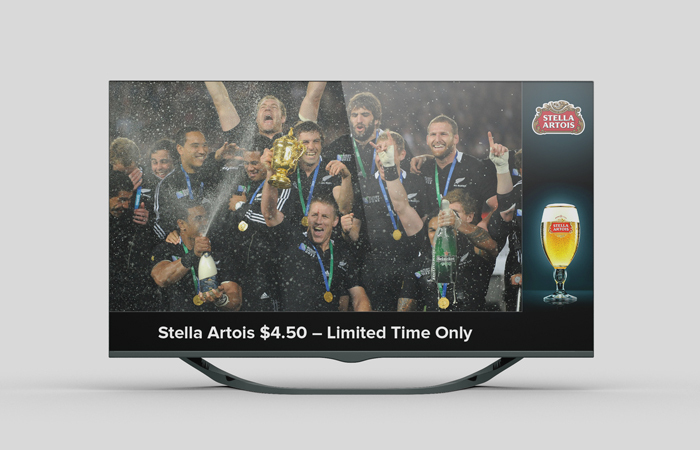 We created a small device in partnership with VMob and Technocell, that plugs into a bar’s TV allowing the owners and managers to overlay advertisements onto them. This device, coupled with an app, provided staff a way to create and showcase offers on the TVs while they continued streaming live sports. What we ended with was a way that Anheuser-Busch resellers could very quickly and easily create and promote a product, having it displayed on all the bars TV's within seconds. This system is valuable to both re-sellers and Anheuser-Busch, it allows staff to make decisions on the spot based on current stock or what's popular that day or night. This in turn gives Anheuser-Busch a better insight into what they can sell and when. 7bomb is a little action hero video to win platform, where skate and snow tricks win you prizes. There isn't a limit to how many times you can enter, and once the video is submitted, the entrant has 7 days to get as many 7bomb votes as they can. 7Bomb is an application development company based out of Auckland that works with iOS , Android, Windows applications. App users can upload videos from their phone gallery or by using the custom in-application video recording feature we've created for 7Bomb. Each video goes through an admin moderation process once it's submitted, and once approved from the admin dashboard, it will reflect on the app and then on the website. Ute enthusiasts have been waiting for this. Let there be revolution, they said, and we signed up to add technical support. The online insurgency cooking up in New Zealand is now in full swing. Because image is what keeps the flame of revolutions ablaze, we’ve made sure every single model looks its best. With the responsive design employed here, content resizes automatically, taking the width of the browser as the reference measurement. So whether it’s a PC, a notebook, a tablet, or a smartphone, the Ute of the users’ dreams looks like the dreams of their best buys. Designed and developed from scratch by UiRevolution, including the photography of the products. This app opens the road to authentic online experience. Easy editing and management of product inventory, quick links, rapid uploads, good looks, all in the same place. The app we’ve created answers well the necessity of modern, fluid browsing, where customers are kings and us their lucky courtiers. High-octane cars plus high-calorie app equals high satisfaction. We’ve put them together to create this online experience for the customers of Renault New Zealand. Users are quick to notice the responsive design, which optimises size, panning, and scrolling as they move from one device to another. We’ve aligned the experience to the highly flexible ways in which communication is done in this second decade of the third millennium. With this app there are no red lights. The highways are open and information flows easily. When it comes to ease of access, there’s no speeding ticket; not with us. Users can explore the whole range of cars on sale like it was their driving test. Without the stress, of course. But with guaranteed satisfaction. Managing stock quality and levels is simple with the Merchandiser app. All integrated into the same system, the job and the main office can be updated with each store's locations stock-levels, advertising quality, and stock quality. Merchandising has never been so easy and user-friendly. The back office creates job tasks, pushes them to multiple merchandising staff and schedules store visits. When visiting stores the merchandising teams use their integrated app to check on the merchandise, tidy it up, replenish the stock, take a GPS and time stamped photo from their app and send it back to the head office for real time reporting. The result is an improved quality of the work output, integrated real time reporting on job status and a compliance audit trail. It doesn’t take a degree in linguistics to figure out the meanings. Our US-based client wanted an easily-accessible Android app that played along the lines of the social networks we have. No headaches, no irritation, no worries - is what they asked for. In other words: maximum simplicity and fun. We did our part and we had our share of fun in the process. An app with a bright future, Shag, Marry, Kill runs on a combinatorial algorithm that randomly picks up images uploaded by the users and turns them into objects of fun. Playing with this app involves choosing between three options (yes, we mean the ones in the title) and making do with what comes out of this game of coincidences. There's always a surprise around the corner. But wait to see the laughs! Augmented reality was seen as an innovative way for readers of the timeout magazine to find gigs and events around town. Simply open the camera and view nearby events over-layed on the screen. The Timeout App also made use of image recognition to enable readers to hold their phone over an article in the magazine and engage more deeply with the article or the advertisement. Advertisers were able to integrate videos with their ads or pop up a 3D fly over an animated model of the product in their ad. All this by simply waving the app across the page. No QR codes required. NZ lotteries needed their adaptive mobile site built for Android and iPhone to be delivered on time and to budget. UiRevolution picked up the project half way through, quickly understood the requirements, ensured the project was delivered to spec and supported the team through the warranty period. To create a more consistent experience for the customers and empower them to a higher level of self service. We also wanted to ensure that the experience was as good on mobile as on desktop. We worked with Zen desk to implement the team to overlay a responsive design. Zen desk is a customer support ticket platform that helps customers track and follow their support tickets. Assigned and managed by a sleepyhead support help, we ensured that the platform conformed to Sleepyheads’ designs. The outcome was a seamless, well-designed customer support portal where customers feel they are in lead to handle the process.